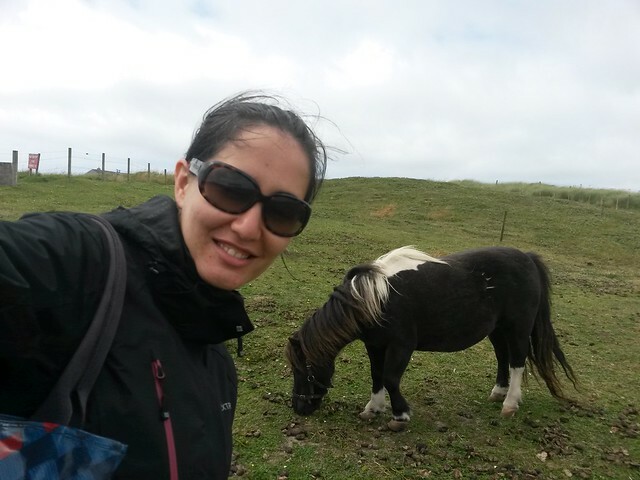 The Shetland Islands are famous for their natural beauty, like its birds, but it also is a lovely seaside town and has some amazing prehistoric archaeological sites. 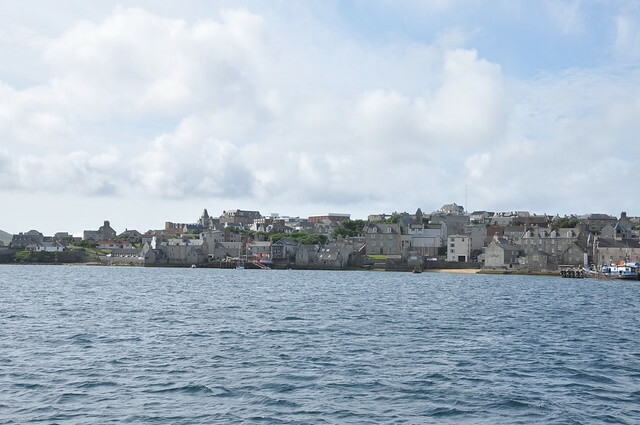 The main town of Shetland is the quaint Lerwick – a beautiful stonebuilt seaside town with a great selection of pubs and restaurants and a super cute stretch of independent shops (Like the delightful Ninian http://www.ninianshetland.co.uk/index.php ). 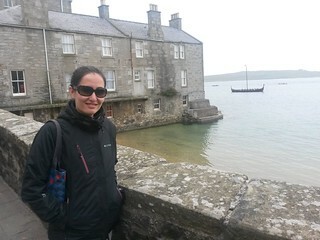 Shetland is proud of their Viking history and are a strong fishing culture. 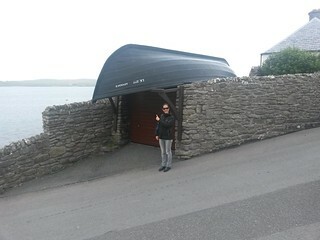 One cute architectural feature the village has is old boats being used as roofs – below they used one as the roof for a garage! SO sweet! 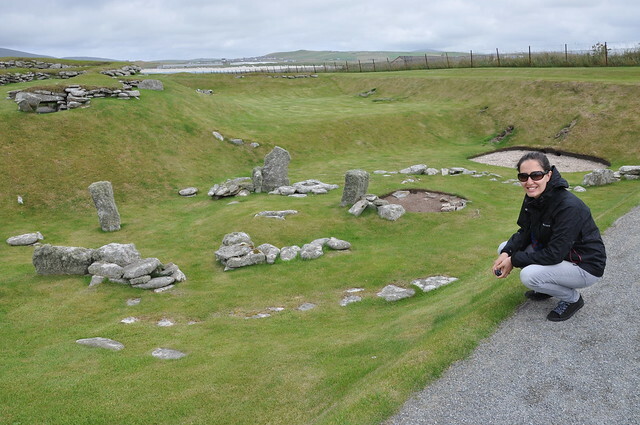 Aside from Shetland ponies and puffins, the islands are also full of prehistoric archaeological sites. 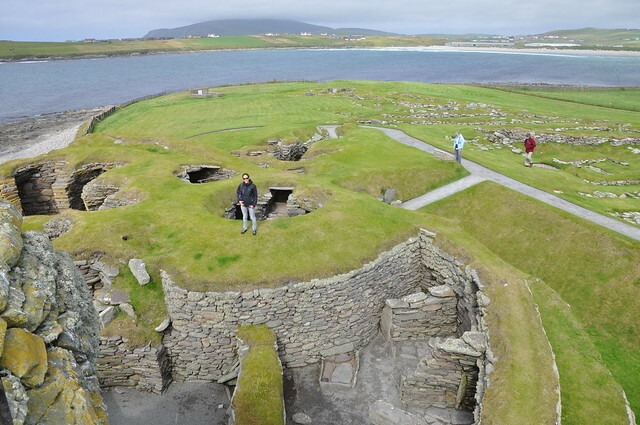 Below is the Clickimon – a broch or roundhouse from around 2,300 to 1,900 years ago. 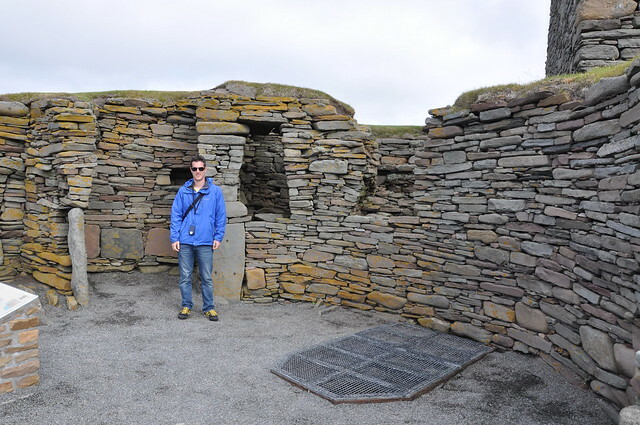 A broch was a multi-storey stone building, the heart of a community, that was used for keeping live animals, cooking and baking food and then drying fish and goods in the rafters above. Brochs were a sign of a chieftains power and prowess, and because of their double-skinned drystone walls, could be up to 10m tall. Around the broch itself were single storey dwellings that would’ve included a blacksmith, a bakery and the individual homes of the community. 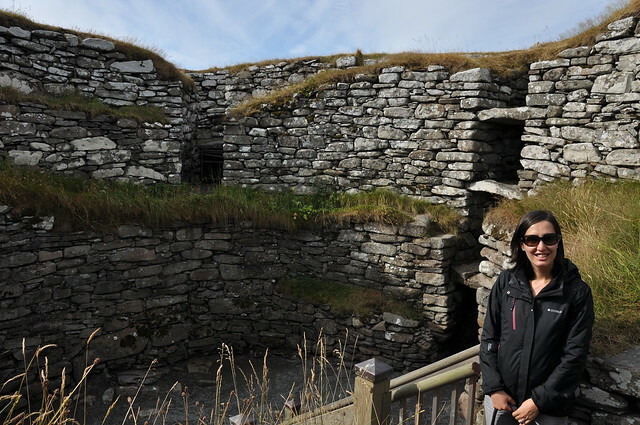 Here inside the broch you can see the couple of levels that would’ve been in use in the past. The floors and levels would’ve been wooden inside this stone structure. This was just one of several prehistoric sites we drove past as we criss-crossed the island. But the best was yet to come. 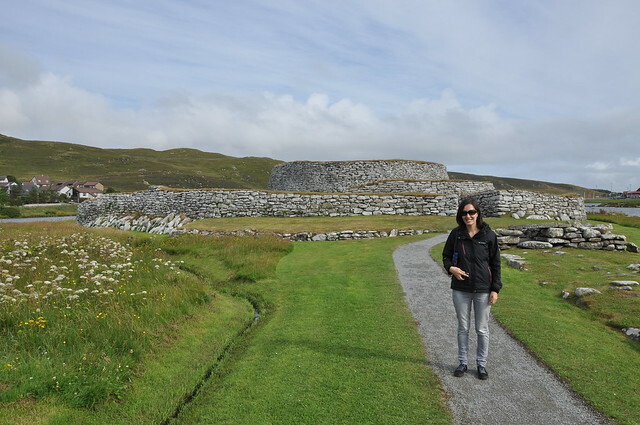 One our last day on the island, we went to see the jewel in the Shetland Island prehistoric crown – Jarlshof, a tentative UNESCO world heritage site, though it seems a certainty from what I’ve seen. 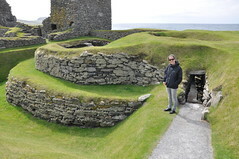 Jarlshof contains some impressive remains dating from 2500 BC up to the 17th century AD. 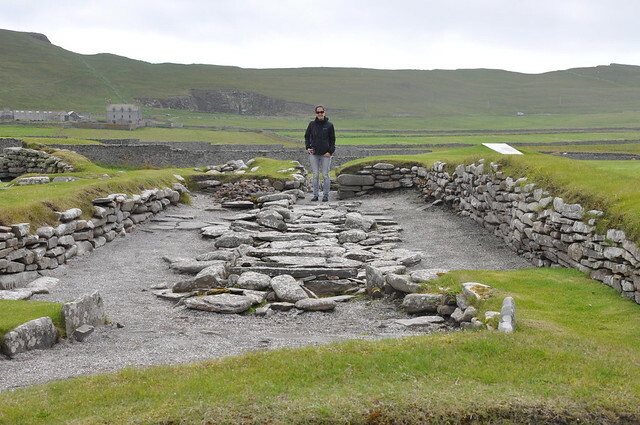 Aside from the Old House of Sumburgh, many of the sites were hidden until a storm in the late 19th century washed away part of the shore, and revealed evidence of these ancient buildings. Excavation started in 1925 and the story before us was unravelled. Amazing. For starters, here is the remains of one of the earliest dwellings from over 4000 years ago (around 2000 BC). You can see an oval house with a central hearth. They’re not sure what they would’ve used as roofs – wood and turf perhaps? For 4000 years old, I’m impressive there’s anything left of this house, even if it’s just a smattering. Next was a Bronze Age Smith’s workshop and home from 800 BC. He would pour molten bronze into clay moulds to make weapons, tools and ornaments. This dwelling would’ve been above ground in the past and was covered over by sand and earth until it was buried like it is. 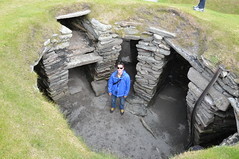 Rob here is standing inside a broch similar to the one at Clickimin, though far less complete or grand. It was from the Iron Age, so between 400 BC and 100 AD. The best dwelling on the whole site was the most well preserved wheelhouse in all of Scotland. The walls are their original height so you could really get a sense for what these homes were like. The roof would’ve been covered with turf to keep warm from the weather, so they were probably quite dark, but still so neat. The earliest part of the wheelhouse complex has been dated to 200 BC, although other parts were built much later. 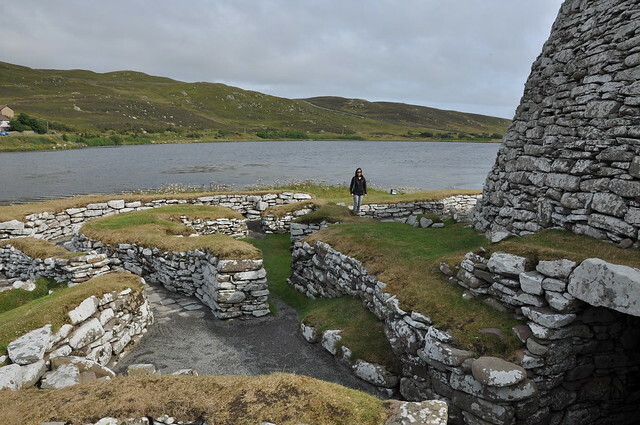 I’m standing in front of the wheelhouse in this picture, and you can see the rest of the wheelhouse complex with the surrounding dwellings. One of the newest of the archaeological remains were a few Norse settlements from 850 AD. 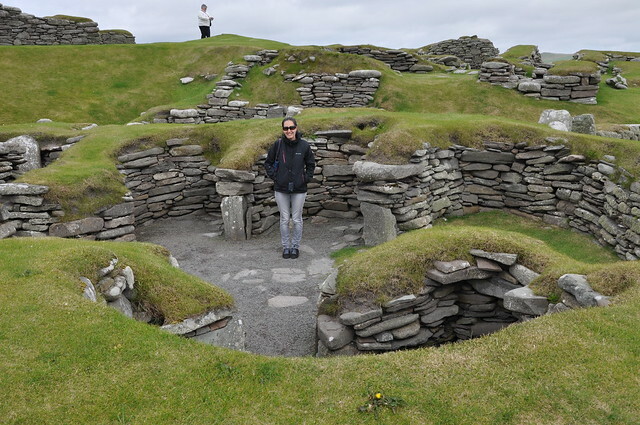 The Norse adapted their Scandanavian long houses to be made out of stone instead of wood, and the communities stayed in Jarlshof for at least 12 generations, building and rebuilding their long houses as required. On the site, there were also remains of Medieval farm houses and a the standing walls of an old 17th century house, but we were exhausted by this point and called it a day. Jarlshof was impressive though and the audio guide was a winner. We really enjoyed our morning there before flying out that afternoon. And on the way to the airport, I got a selfie I’d been angling for all weekend. Perfect. Thanks to John and Gloria for being such great travel companions for the weekend! We had a wonderful time. We do have a couple more European adventures to blog about from last year. I promise to catch-up on all of it. Really, I do.